Perfectly situated on the casino rooftop, the Citrus Grand Pool Deck is a pool-party paradise showcasing more than 35,000 square feet of entertainment and special event space, a sparkling infinity pool, restaurant and full bar, semi-private cabanas, a fire pit, backyard games including corn hole, foosball, table tennis and more and a grassy seating area complete with umbrellas and outdoor day beds. 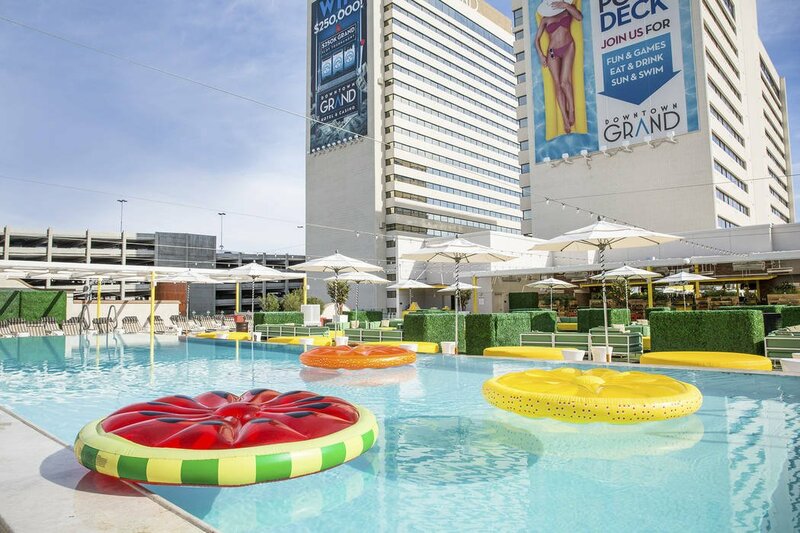 Casually-fun and approachable, Citrus Grand Pool Deck is always free for hotel guests. Enjoy a refreshing and relaxing day splashing around or lounging poolside and experience an amplified pool party under the starry skies at night. While enjoying the outdoor oasis, poolside dining and cocktails are a must. The menu at Citrus (created by Chef Scott Commings – Season 12 winner of Hell’s Kitchen) offers an array of perfect poolside fare including Brick Fired Lavosh Flatbreads, Watermelon, Jicama & Feta Salad, Hummus & Grilled Pita, Street Tacos and Pineapple Soft Serve. Following a meal shared with friends, it’s time to sip on a refreshing signature cocktail like the Citrus Tango and Fantasy Punch, or try one of our Frozen Cocktails including the Frosé, Pina Colada or Miami Vice. Tables start at $150 Monday – Thursday, $250 Friday – Sunday. Cabanas start at $300 Monday – Thursday, $400 Friday – Sunday. Take a sip of one of our citrus-inspired cocktails. Bite into our fun seasonal menu created by Chef Scott Commings, Hell's Kitchen Season 12 Champion. Dance on the rooftop with local DJs performing every Friday thru Sunday.